I will not be an Extreme Couponer, I will not be an Extreme Couponer, I will not be an Extreme Couponer, I will not be.... Remember when I said that?? It’s been exactly one month since my post where I announced that I had decided to try couponing. If you remember, my friend Karen had recommended that I try it out and I decided that even though my grocery stores didn’t accept coupons, I did enough shopping at stores like Walmart, Target and CVS, all of whom did accept manufacturer’s coupons, that I’d try it out and see how I did. I’m very good at it, or at least I think I am. And, best of all, I actually have been saving us tons of money, while getting us tons of free stuff we need too, for one month now. Because of our tight budget, having coupons on name brand items has allowed us some treats that we normally couldn’t afford, along the way as well, and that’s been fun. I’ve never seen my kids so excited for yogurt as they were the night I brought home all the Yoplait Crunch yogurts and the Yoplait flavored yogurts. They took turns calling out who was getting to eat which flavor and Alex took over loading them all into a special spot in the fridge. Yogurt. Really. Here’s my recap of the last month; how it’s gone and what I’ve learned. First, before I begin, I can’t thank my friends Karen and Pam enough. Both of them provided me with lots of couponing advice and Pam is local, so she was even nice enough to come with me a couple of times and was very patient as I shopped. Both of them were also extremely patient all month long as I would shop and then send them photos, texts and instant messages of what I’d just scored for free. Very patient, very good friends. I found that I got the best deals once I'd gathered lots of coupons. These three packs of pens were at Target for 97 cents but I had three one dollar off coupons so all three packs were free! My first purchase: a way to organize and store my coupons. Organization is key. 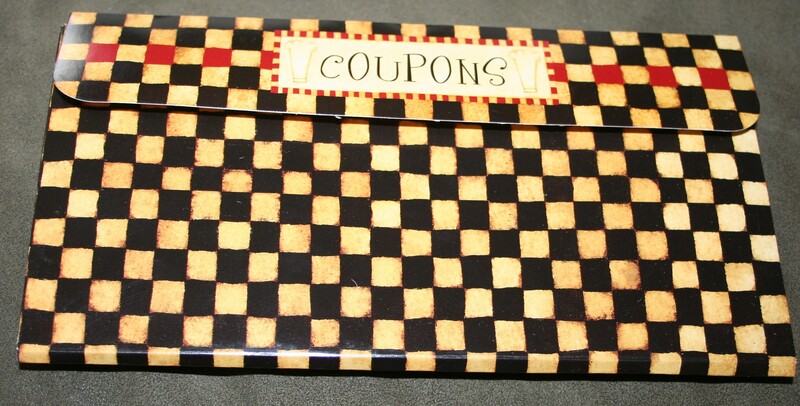 2) To actually be a couponer, you need to have an organized way of storing your coupons. People use binders, expandable files, bins and more. I chose to buy two expandable files, each one has 13 spots plus extra spots in the front. I got them at Target. I chose to organize them in alphabetical order so the first one is A-D and the last one is D-Z. So far, I haven’t had any problems with this method. 3) It’s important to go in with a list. Know what you’re looking for, what you have coupons for, what you’re getting for free, and what you need to put into separate transactions, if applicable. Being organized is key. Several of the sites I mentioned above do this organizing for you. They tell you what’s on sale at a store, what manufacturer’s coupons are out there and even give you a link to print them from if available. They also often tell you the best way to get the most for free, as in which coupons to use and how to organize your transactions. There’s lots of information and help out there. 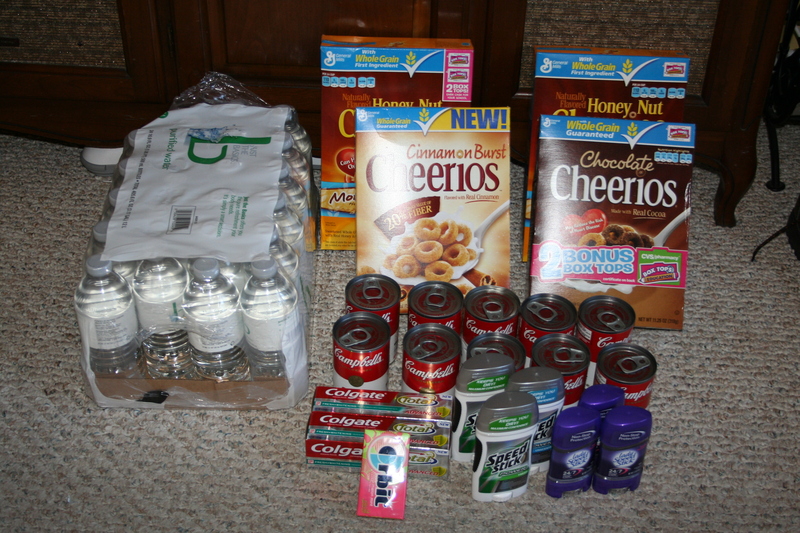 This was my January 30 haul of free stuff from CVS-every item seen here was free- but this was not my best one. I put out more out of pocket money then I like to now. But, I'd just started. What did I know? When I wrote my original post in January, one of the things I said was that I didn’t want to go to more than the stores I normally would go to, that I just wanted to save on what I already bought, where I already bought it. I’m pleased to say I’ve stuck to that, but I can tell you it’s SO tempting to look at other circulars and see what else is out there, where else I could go. For now though, I’m sticking to my guns. I normally shopped at Target, Walmart and CVS for my non-food items and that’s where I’ve focused my couponing efforts. I also had two other goals in mind when I decided to start. The first was that I didn’t want to spend hours and hours doing this. I didn’t want it to take a whole lot longer than making a normal shopping list would take. I will say the very first time I did it, it took me a little bit of time to organize myself, but overall, I don’t spend a ton of time on getting ready. I am not one who wants to make this my full time job. I don’t want to spend 40 hours a week couponing and shopping. Maybe some day I will change my mind, but at this point, I’m not feeling it. I like going on my way to or from work or when I have a few minutes before I need to pick up my kids at school, but I don’t spend 13 hours in a store, or 40 hours a week making lists, the way I’ve seen on TV. 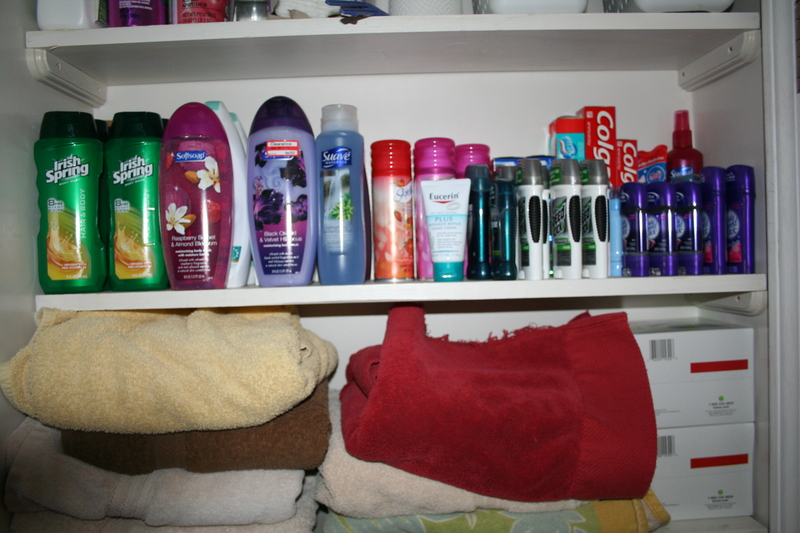 Here's where I store all body wash, shaving cream, shampoo, conditioner, deoderant and toothpaste. Once it's full, it's full. There's no more space now, and this photos doesn't even show it completely full. The second goal was that I would never buy more than I could store. It’s only been a month, but I can already see why these extreme couponers end up storing 200 rolls of toilet paper under their kids’ beds and in their living rooms. I can see how it can get out of hand. The first thing I had to do very quickly was figure out where I was going to store the things I was getting for free; or what everyone calls their “stockpiles.” Since I was mostly shopping for health and beauty items, I went into my downstairs bathroom and completely cleared off one shelf in there. I decided that was my space for stockpiling and once that space was full, I’d not buy those particular items again until I had more space to put them on the shelf. My shelf was full in two and a half weeks. Full. Here's where I currently store any medications and makeup items that I get for free, as well as anything that won't stand up on a shelf, like toothbrushes. 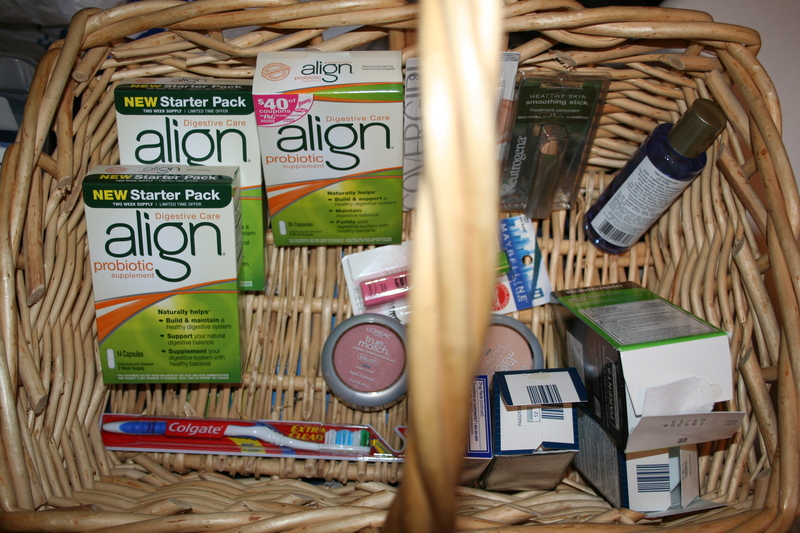 I took a big basket for any medication type stuff I was getting for free as well as makeup items. That basket was pretty big and many of those makeup items are pretty small, so that basket isn’t filling up as quickly as my shelf. 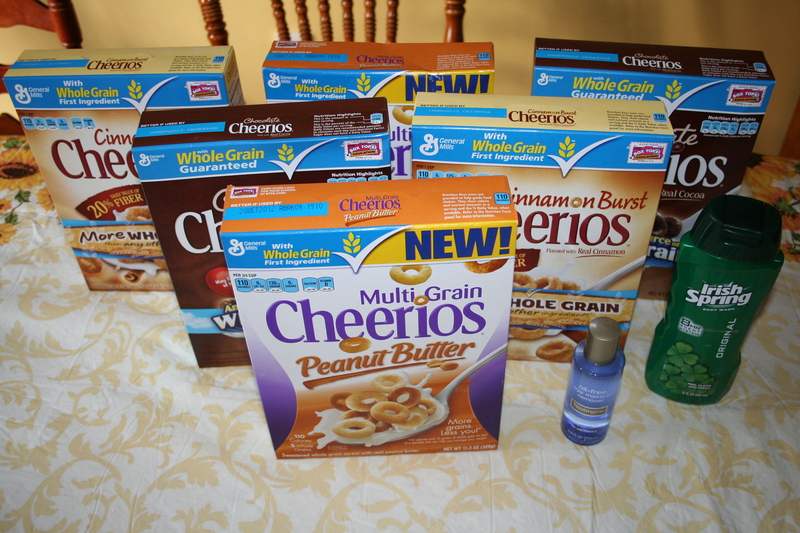 My pantry shelves in the garage are still for food items, but since I buy most of my food items at stores that don’t take coupons, that hasn’t been much of an issue, except for the week when I got ten free boxes of Cheerios at CVS. That created kind of a storage issue. However, we go through a lot of cereal so it was only a temporary storage issue. At Target on Saturday night I got all this for just $20 because I had so many coupons. I didn't have coupons for the eggs, sausage and tortilla wrappers (wrappers not shown) but everything else I did. For example, the vitamins which are normally $6 I paid $2.16 for. My most favorite and most successful shopping trips have been at CVS, with Target being a close second. The reason being that they both provide sales and their own store coupons that can be combined with manufacturer’s coupons too. I never knew that. So for example, if you see something on sale at CVS, and they have their own coupon for it, and you have manufacturer’s coupons too, and if by chance you get their Extra Bucks as a result of purchasing said items, you’re golden. CVS also recently changed their coupon policy too, where you can not only use coupons on the items you buy, but if you have a buy one get one free sale, you can use coupons on the item you buy as well as the item you get free. That’s how I ended up with so many boxes of cereal. CVS also has a coupon machine when you walk in the door where you can scan your CVS card every single day, several times in one trip, and get coupons and sometimes even Extra Bucks too. I spent a lot of time in February getting reacquainted with my local CVS stores. Getting better...at CVS on February 13 I spent $20 out of pocket for items not pictured here, and then got all this totally free with coupons and Extra Bucks I'd earned. Pam was there, I did a little dance when we left the store. I couldn't believe how well I'd done. 1) How often CVS has sales where you earn Extra Bucks just by making a purchase. “Buy this item and get $4 Extra Bucks at the register.” You then can turn around and use those extra bucks to purchase more items, totally free. On one of my trips I earned $42 in Extra Bucks. I spent them on items that earned me more Extra Bucks and earned $12 more Extra Bucks. Additionally, all quarter long you’re earning an additional percentage your spending back in the form of Extra Bucks that you’ll get at the end of each quarter. CVS also has a Beauty Club and every time you spend $50 you get $5 Extra Bucks, even if the $50 you “spent” was on things you “bought” for free. On your one year anniversary with their Beauty Club you get a 10% off your next Beauty Purchase coupon and it’s off your entire purchase plus what you purchase earns you more extra bucks. It’s never-ending. 2) Target’s Red Card can be a debit card OR a credit card and every time you use it you get 5% off your purchase plus your school of choice earns points. I always thought it was a credit card only and we don’t do credit cards, so I never applied for one. Now I have one and use it every time I shop. Another CVS haul. I spent $27.10 out of pocket for items not pictured here, and got all of this for free, earning more Extra Bucks from this purchase as well. Another goal I had was not purchasing anything I wouldn’t normally use or need at my house, just because it’s free, and so far I’ve been good at that. But I will say, I’m an easy-to-please shopper because in general we are not brand-specific unless there’s something we totally hate and won’t use. So for example if Crest Toothpaste is free one week, I’ll get it. If Colgate Toothpaste is free another week, I’ll get it. If Dove Body Wash is free, I buy it, and if the next week it’s Softsoap body wash, I get that too. Until I find something I hate, any brand is good. And I can tell you, I won’t need to buy body wash or deoderant or shaving cream or shampoo and conditioner for a long…long….time. Although on the flip side, with four women in the house, we go through one bottle of shampoo and one bottle of conditioner every single week on average. So although it looks like a lot on hand, it goes fast. That’s a savings of $270.81 of items I got for free. The biggest difference I see is that normally each month in between the grocery shopping at Price Rite or Aldi’s I’d be spending at least $100 or more every pay period at Walmart or Target or CVS on needed health and beauty items, over the counter medicine, paper goods and cleaning items and I’d only buy what I needed because I was paying full price for them. For example, in my basket photo, notice the Align? It’s normally more than $30 a box for a month’s worth of pills, which I’d pay out of pocket for every month because my daughter has to take it every day. Of the three in the basket, two were free, and one I got down to $14. This month I noticed already that my usual “big” shopping at Price Rite two weeks ago was also less than normal, under $200 for two weeks’ worth of items and I know that it’s partly due to the fact that many of the items I automatically bought there, I now had on hand for free because of my couponing (like cereal, lunchbox snacks like granola bars, and Kleenex for example). Now that it’s time to shop again, there’s very little that I need because of my new “stockpile,” so I expect my next trip’s total to be way down as well. I also noticed that I didn’t need to make not even one single Walmart run this month for health and beauty items or cleaning items. I got them all using my coupons at Target or CVS and earned a large portion of them for free. That’s the kind of thing I was just automatically buying as needed before, and paying full price. Now, not only did I buy what was on my list for right now, in some cases, I also have it on hand for later too, saving me money down the line as well. Because my first shopping trip on January 30th was the one where I spent more out of pocket than I wanted to, I am curious to see how month two goes, now that I know what I’m doing and now that I have more coupons. After that first trip, my next trips had shockingly less out of pocket than that first one, so I know I’m already doing better. This was one of my favorite CVS hauls because it was a total shock. I ran in for conditioner one night, we were totally out and the kids were IN the shower at home. I quickly scanned my CVS card, and to my surprise I found that I had $5 in Extra Bucks. 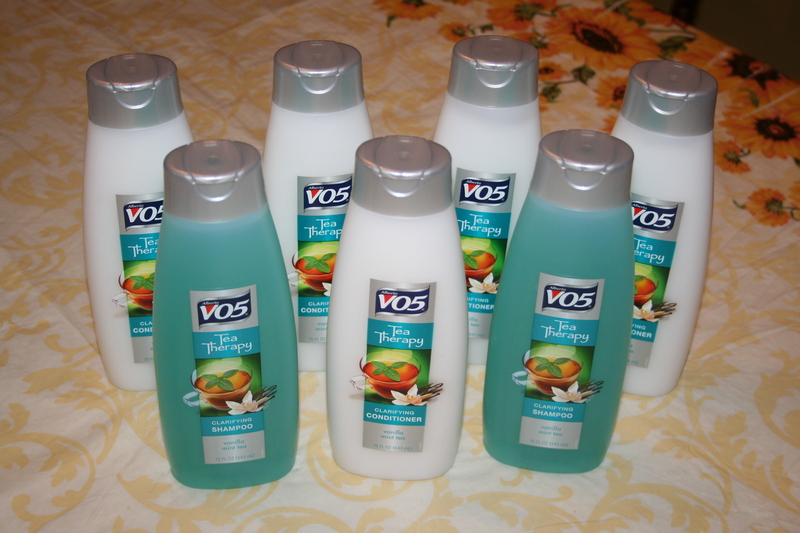 I went to get my favorite shampoo and conditioner, the VO5, which is normally 99 cents a bottle. It was on sale for 77 cents a bottle. I came home with seven bottles and paid 42 cents out of pocket. So there you have it. My one month update on couponing. I love it, I now see a huge value in it, both in the money I’m saving and the fact that I have things on hand now that I don’t have to buy just when I’m out of them, in turn paying full price instead of having gotten it on sale with coupons and stockpiling it. I shudder to think of all the coupons I’ve tossed in the past, all the money I could’ve saved, but my friend Pam is good about telling me not to look back, to only look forward. And then, she gives me more coupons. Aaaah… you inspired me to follow my cvs bucks potential more closely- and look- I used $5 extra bucks to buy 2 toothbrushes @ $1.24 each (on sale) and a package of the toothbrush covers for 2.79… after my $5 extra bucks- it all cost me .29! and I earned 2 more extra bucks- but I resisted my temptation to use that to buy 2 candy bars and get one free. For now, I will hold the 2 extra bucks and see how far I can stretch them- or combine w/ other coupons & store sales… stay tuned! Kristy I’ve added your site to my list of helpful couponing sites in my post!